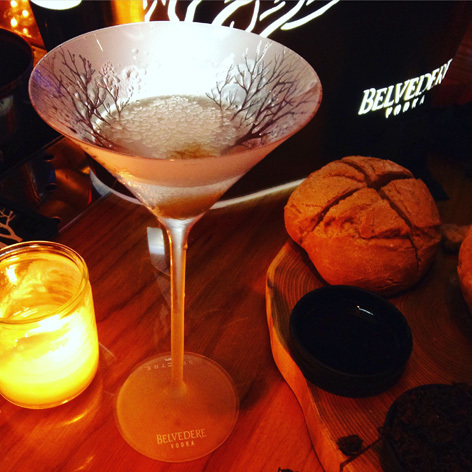 In case you haven't noticed yet: Belvedere is the vodka brand associated with the movie SPECTRE. If the vodka will be seen in the film and who drinks it is not yet known, but the advertising campaign featuring Stephanie Sigman is already in full swing, making sure you know the name, and you know the recipe. 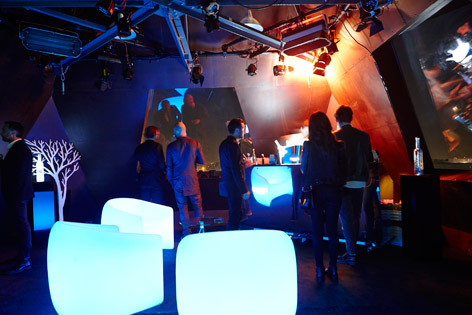 I was lucky to be invited to a few Bond related Belvedere events in the past year, and they all have been very luxurious and stylish, but the latest event in Amsterdam on 8 October was a real Bond experience. The evening started in The Oyster Club bar at the Olympic Stadium, with of course a never ending supply of Belvedere martinis, shaken not stirred. A select group of members of the Dutch press gathered at the stylish bar. While networking, drinking a martini and having cocktail party appetizers, guests were mysteriously taken away in small groups of 2 or 3, by a beautiful and mysterious woman. After about an hour almost every guest had been taken away and I was one of the few still holding a martini (in a special frosted SPECTRE martini glass) at The Oyster Club. But then finally it was my turn. Instead of joining others, I was taken away alone, without words, but with gestures I was guided to a small door and stepped onto a dimly lit path that led to the oval athletic race track in the center of the Olympic Stadium. As soon as I took my first steps along the path into the darkness, I saw and heard a sportscar racing towards me, curving around the athletics track, screeching to a halt at the end of my path. 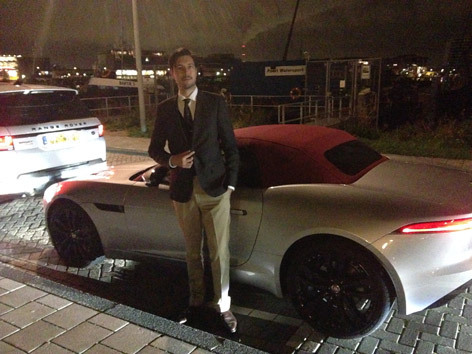 I could just see that it was a beautiful silver grey Jaguar F-Type convertible with a red soft top. The driver got out and opened the door for me, inviting me in the passenger seat. Good thing there was a chauffeur, as driving the 380HP sportscar myself after drinking a few martinis would probably end up in a world record breaking rollover, the complete destruction of the car and an even bigger hangover. 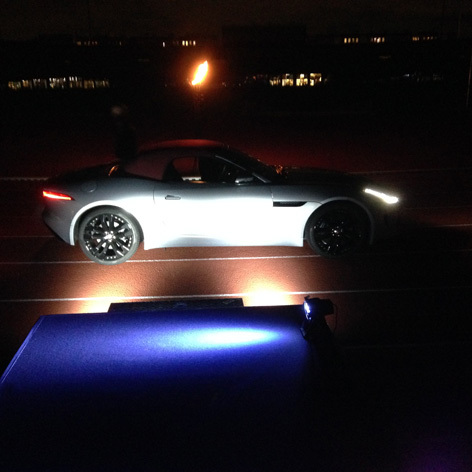 As soon as the driver and I were settled in the smooth leather seats of this brand new F-Type (less than 500 miles on the clock), the driver took off with skidding wheels and roaring V6 engine, and raced along the second half of the running track, and out the other side of the stadium, into to bustling streets of Amsterdam. 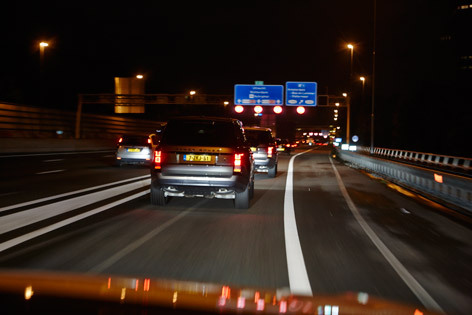 What followed was a high speed tour of the city, towards the next secret destination. As I admired the sound of the car as it accelerated and screamed through tunnels, I was handed a SPECTRE envelope, which contained a message and clue for the next location. It didn't make much sense yet, but the experience of the exciting drive was already distracting enough. I found out during the trip that other guests were driven in the latest Ranger Rovers and Jaguar XJs to this secret location. 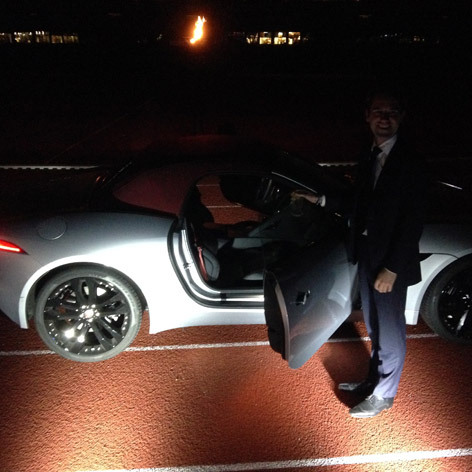 But I was happy to be one of the lucky ones to get a private ride in the stunning F-Type sportscar. After about 15 minutes trying to break every speed limit in the city, we arrived in the north of Amsterdam, and I was dropped off at the Faralda Crane Hotel, a unique hotel with 3 designer suites built in an old freight crane (see the website for some great images of this hotel). The Crane Hotel entrance. Not exactly Christmas, is it? Would you get into a small elevator with her? The things we do for the Bond Lifestyle. 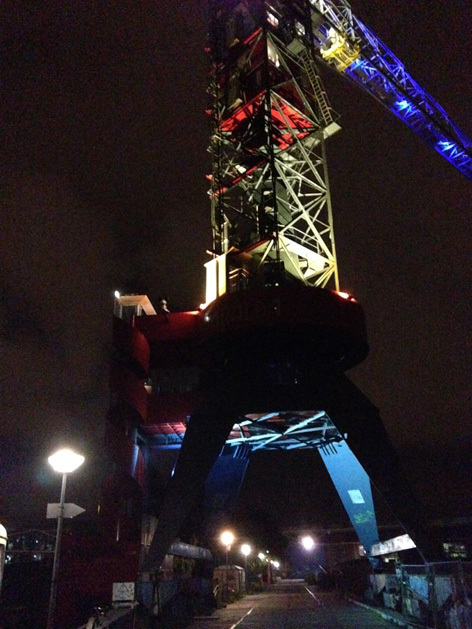 A female lift girl took me in a industrial looking crane elevator to the bar of the hotel where, not surprisingly, more Belvedere martinis were served. I ordered a dirty one here, while I was told to wait for two other guests to arrive. Together with my two new allies (the Managing Director at Moet Hennessy The Netherlands and a fellow journalist, Albert from MisterCocktail.nl), we solved riddles and puzzles in one of the hotel rooms. We finally found a gold clad Bond girl sleeping in one of the bedrooms, who we had to wake up with a secret code. Our group turned out to have solved the mystery the fastest of the whole evening, probably because I was the only Bond fan, which made some of the questions fairly easy! Erm, what was the question again? 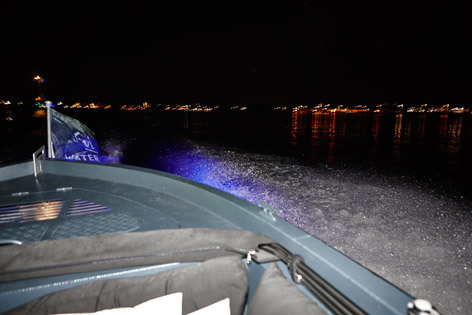 But the evening was far from over: the race though Amsterdam was continued on the river IJ in a hand crafted Waterdream speedboat. The boat took us to another location (with just enough time to drink another cocktail during the trip) where once again our vehicles were waiting for us for a final ride. I switched cars as I wanted to experience the Range Rover Sport and Mister Cocktail was happy to exchange his comfortable Range Rover seat for a more sporty Jaguar ride. Goodbye Jaguar. Hello Range Rover. 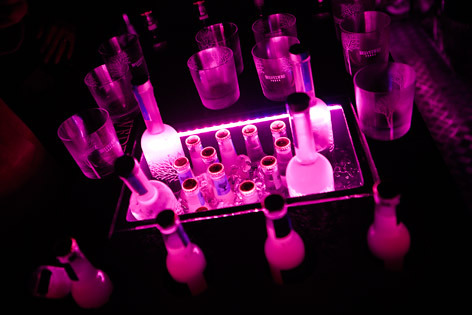 The brand new Range took me to the fancy 5-star Okura Hotel in the center of Amsterdam, where one of the top floor bars was turned into an exclusive party, with models and martinis as far as the eye could see. As if I didn't have enough Belvedere vodka that evening, the goodie bag at the exit included a 70cl SPECTRE Belvedere bottle. Living like Bond is never easy. 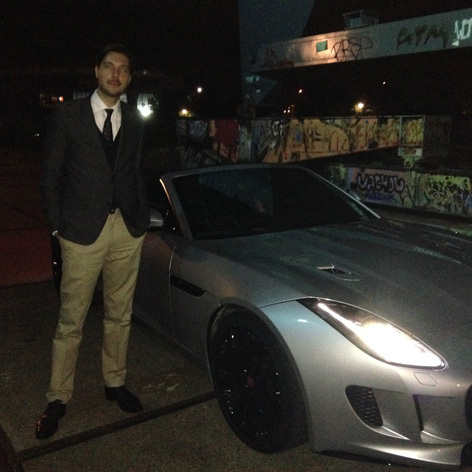 Thanks to Nicole Canoy (LVMH The Netherlands) and Gili Papier (Maison PR) for this exciting Bond evening. 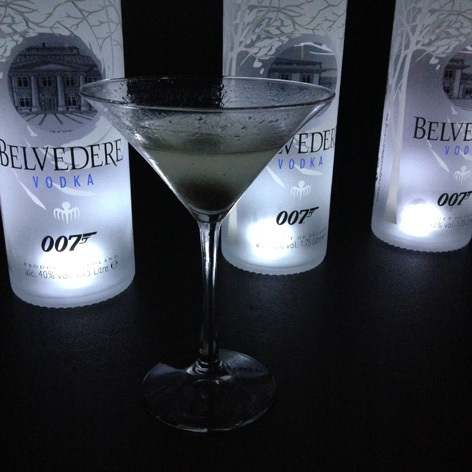 Find out more about the Belvedere SPECTRE bottles here or visit the Belvedere website. Many thanks for that write-up, and for the photos. A Bond evening make no mistake, you lucky man! Glad you had a good time, I think it would have been impossible not to!